As many of you will be aware, I am a regular contributor on the Golf Monthly forum (http://forums.golf-monthly.co.uk/). As well as a fantastic melting pot to discuss all things golf related, they organise a fantastic charity day each year in aid of Help4Heroes. This year was no different with forum members from across the UK descending towards North Hants Golf Club on Monday 29th September. 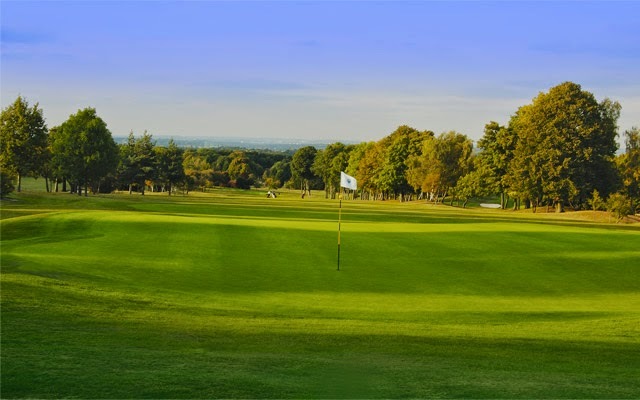 To help make these trips viable, there were a number of games organised over the weekend and I was fortunate enough to bag a round at Cuddington Golf Club near Banstead in Surrey. Cuddington Golf Club was opened on 1st January, 1929. The course was designed by H S Colt in conjunction with John Morrison and Frank Harris Brothers who produced a downland course of good length and variety. The greens were large and offset to emphasise the correct line of play. Initially the course was virtually tree-free but over the early period of the Club a major tree planting operation was conducted which involved, it is said, the planting of 10,000 saplings. At 6,000 yards the course was then considered long and acquired a bogey of 78. The course has subsequently increased in length to over 6,600 yards with a current par of 71. A practice ground was created in 1967. In 1999 all the greens were totally reconstructed to USPGA specifications. The new greens were first played upon in June 2000 and whilst this work had been going on a number of tees were moved and improved. Improvements to the course continue. We were fortunate enough to sample the course off the white tees, playing its full distance of 6,603 yards. On a exceptionally warm and sunny day but with the tress just beginning to put on their Autumn display with the leaves changing to wonderful rustic browns it was a fabulous environment to enjoy a mornings golf before getting back into the sumptuous 19th to watch the end of the Ryder Cup over a a meal and a drink. The second is also a par five and one of the first holes that has an abundance of trees which looked stunning. A par five cheered me up.The next is a testing 442 yard par four. A good drive still left a four iron into the green. I hit it well but it just missed the green right. A good chip and putt secured another par. If you regularly follow my golfing exploits (thanks if you do, and if not I hope you will after this) you'll know that the 2014 season has been blighted with numerous good shots and rounds ruined by a bad shot or hole from nowhere. This was the case again at the next. It's a short 168 yard par three. I carved a five iron miles right into some bushes and although I got it out and pitched on, a double bogey ensued. 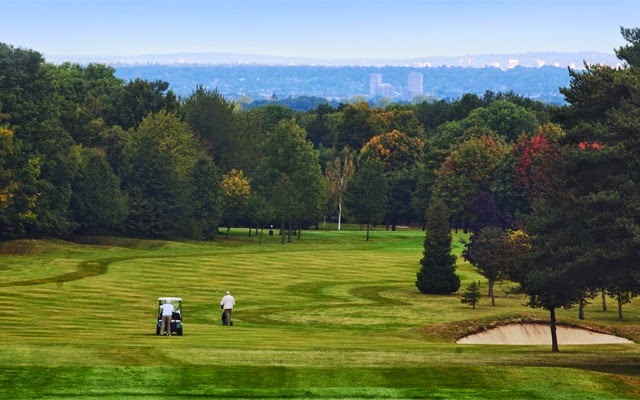 As the course meanders on, it's so quiet giving its proximity to London and the bustling commuter towns of Epsom and Banstead. It's secluded and there's little traffic noise. If there was a small gripe, it's that you have to cross several roads to get to the next hole but that aside it's a real hidden gem. My golf continued to be a curates egg of the good and bad. The par three's in particular were a real graveyard of poor shots and dropped points and I made several double bogey's. They aren't particularly long, the 201 yard 16th being the longest but I kept making bad swings on them. However on the longer holes, the par four and fives I was driving the ball wonderfully and striking it as well as I have for a while. The final two holes are challenging. The 17th is 486 yards and plays as a par five off the whites. I hit a good drive and an excellent fairway wood but still came up short. A mediocre pitch and three putts made for a disappointing dropped shot. The closing hole plays uphill towards the imposing clubhouse. At 420 yards it's a stern par four. Again I hit a glorious drive, leaving 205 yards into the green. I hit a great five wood but it was still short facing a tricky pitch over a bunker. I stuck it to ten feet but couldn't make the par putt. After a fantastic day's golf in great company it was time to retire to the clubhouse. The bar area was packed with members watching the Ryder Cup play out to a conclusion but it made for a great atmosphere. There is a wide range of beers on offer and I took full advantage of their one course carvery which was reasonably priced at £6.95 and was very tasty. Aside from the bar area it has a restaurant area and dining room making it ideal for parties and weddings and is decorated in a very light, modern way. The imposing clubhouse hides a great bar, and fantastic dining room. I have to say despite having lived pretty close to Cuddington for many years, it's never been on my golfing radar which was a big error. It's a a warm and inviting members club and I really enjoyed seeing the professional teaching a gaggle of kids on the putting green as we teed off. I'll definitely be back for a return visit and if you are ever in the area, it's well worth the effort to seek this place out and enjoy a decent course, well maintained, with reasonably priced green fees.